We all know we’re supposed to eat at least five portions of fruit and vegetables a day, but how many of us actually do it? Even those nodding your heads probably don’t get your 5 a day everyday. But it’s actually pretty easy to up your daily intake of fruit and vegetables once you know a few simple tips for adding healthy ingredients to your meals. Eating a minimum of five portions of fruit and vegetables is good for all the family and once you have got your family into the healthy eating habit, you will be giving them a good start in life. A balanced diet filled with fresh fruit and vegetables is proven to help overall health as well as your mental health and a positive general outlook. It is all too easy to just have toast with jam and a cup of tea or coffee for your breakfast, but even if you have wholemeal or granary toast, it’s not a very healthy, balanced breakfast. In order to start the day as you mean to go on and have some of your 5 a day before you’ve even left the house, how about trying a few of these simple ideas to give your breakfast a nutritional boost? Always have a glass of fruit juice with your breakfast – this counts as one of your 5 a day (however much juice you have is one portion, so just have one glass as it can be quite sugary). Add peanut butter and a chopped banana to your wholemeal toast. Get used to whipping up a quick smoothie while you wait for the kettle to boil – put a banana, bio-yoghurt and a handful of strawberries in the blender, or try a tin of mango (in juice, not syrup), a tin of pineapple and some apple juice. If you take your lunch to work, try to get used to taking a portion of last night’s dinner and you’ll soon save money and be more in control of your 5 a day. You can easily turn last night’s roasted vegetables into a delicious and healthy lunch in pitta bread with hummus, or try adding some tuna and sweet corn to cold pasta. A great way to up your lunchtime five a day is to take a small Tupperware with easy to grab fruit and vegetables such as cherry tomatoes, grapes, dried apricots or raisins. Why not do as the French do and always have a side salad with your dinner? Or try the Italian way of having a starter of simply steamed greens dressed with a little garlic and olive oil? That way, whatever you have with your dinner you are already including one extra portion for your 5 a day. Try adding extra vegetables to bulk up family favourites – add a well-cooked cauliflower to your lasagne béchamel sauce, or add finely chopped carrots and leeks to your Bolognese or chilli. Fruit and vegetables are the perfect snack for busy working people and growing children. The hassle is usually in the preparation and by the time you’re hungry it’s easier to reach for the cookie jar. Why not prepare some carrot or cucumber batons and have them ready in the fridge to dip in some healthy tzatziki (Greek yoghurt with mint) or low fat cream cheese? Or get into the habit of keeping a well stocked fruit bowl and encouraging your family to help themselves? 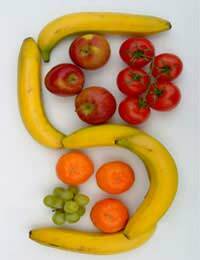 It’s easy to add to your 5 a day and have a healthy diet when you try to have extra fruit and vegetables at every meal.